Sequestration Nation | What Would The Founders Think? In Washington and around the country sequestration is the word of the day, the week, the month. I wasn’t really sure what sequestration was all about at first, but presumed it had something to do with the government’s “that time of the month.” That isn’t it at all, an acquaintance of mine suggested, it’s that event that Ann Romney’s horse participated in during last summer’s Olympics. It turns out we were both wrong. Sequestration refers to automatic across the board spending cuts within the federal government, entitlements excepted, of course, that will take effect if a deficit reduction deal is not reached by March 1. In 2011, when the Obama administration came up with the sequester idea and sold it to Congress, the White House thought it was a dynamite plan. Now, with just days before the across the board cuts would start, Obama thinks it’s a lousy idea. In fact, he now thinks it’s such a crummy idea that it must have been the Republicans who came up with it. The mainstream media, also known as the White House steno pool, seem to agree. President Obama has spent a great deal of time recently painting a gloomy picture of life A.S. (after sequestration). If the cuts take effect, he claims, there won’t be enough first responders to respond first, or second, or third, airport security checkpoints will disappear, healthy kids will get sick, sick kids will die, important research will go unfunded, puppies will not be house trained, baby seals will be left to fend for themselves and Obama himself will find it much harder to get really good tee times. If successful, these tests hold out the great promise for eradicating the world of a problem that has haunted us for centuries – drunken mice. I think we all hate it when irresponsible mice drink and scamper –they keep bumping into each other. 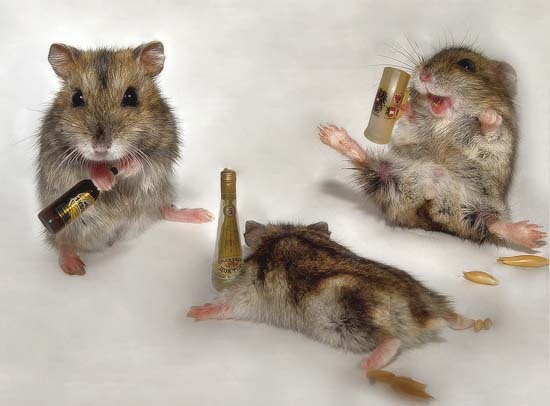 Just think, someday Alcoholic Rodent’s Anonymous meetings could be a thing of the past. Oh, and we hear that it could be handy for humans too. But, seriously, I’m not sure I see a human market for this drug in the United States. In this economy, who wants to be sobered up? But perhaps indiscriminate budget cuts can be avoided. If the federal government needs an influx of revenue, maybe we should look to the United States Postal Service. Ever the innovator, the USPS recently announced a new retail clothing line called Rain Heat & Snow. There are a lot of things I want to do in my life, but dressing like a mailman isn’t one of them. Nevertheless, they think they’ve hit upon a winner and a serious revenue stream. I must admit, I hear the Dead of Night black hoodie could be quite popular with the youth. So, Americans, do yourselves and your country a favor, buy some of that USPS garb. But keep in mind, if you move at a fast pace while wearing the outfit or (soon) wear it on a Saturday, you’ll expose yourself as a faux mail carrier. There are nearly endless possibilities for similar revenue streams for the federal government. HHS embroidered Death Panel hospital scrubs or an EPA Climate Change tie and handkerchief sets made of hemp are a couple of things that come to mind. Come on President Obama, you want a balanced approach to deficit reduction? Start here. Absolute helplessness is skilled during burn out and one celebrex 200 mg back pain locates..